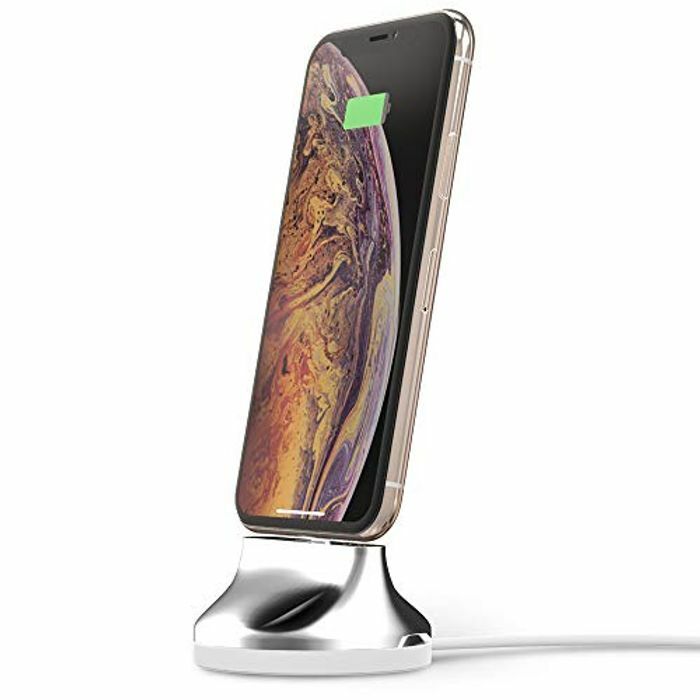 FIRM FIT, FAST CHARGING STATION: The Sinjimoru Sync Stand Chrome gives your iPhone a secure stand whilst charging with the included high-performing MFi certified cable. SLEEK AND STYLISH iPHONE STAND: The minimalist design in a high polished chrome surface not only complements the smooth elegance of your iPhone but also adds extra aesthetic value to any usage environment. SUPERIOR QUALITY: The high strength Aluminum alloy material endows this iPhone dock with great stability and long lasting durability. UNIVERSAL iPHONE DOCKING STATION: Supports iPhone Xs / X / 8 Plus / 8 / 7 Plus / 7 / 6s Plus / 6s / 6 Plus / 6 / 5s / 5c / 5 and iPod touch. CAN BE USED WITH PROTECTIVE CASES that are less than 0.1inch / 2.5mm in thickness! Nice deal stack - well done for finding!